As you have probably already noticed, definitely golden comes now with a brand new title design (thanks to this lovely man here and his beautiful handwriting) and I couldn’t be any happier about it. But there is even more news: at the right side you find two new buttons standing for two new series, Captured and Wanted. The first one is going to be dedicated to Instagram, among others to little subjective observations and thoughts. The latter introduces you regularly to a personal selection of a few lovely things covering a wide range: expensive, impractical, indispensable and affordable. I figured it would be a shame to exclude any of those categories from my list and with that, from this blog. 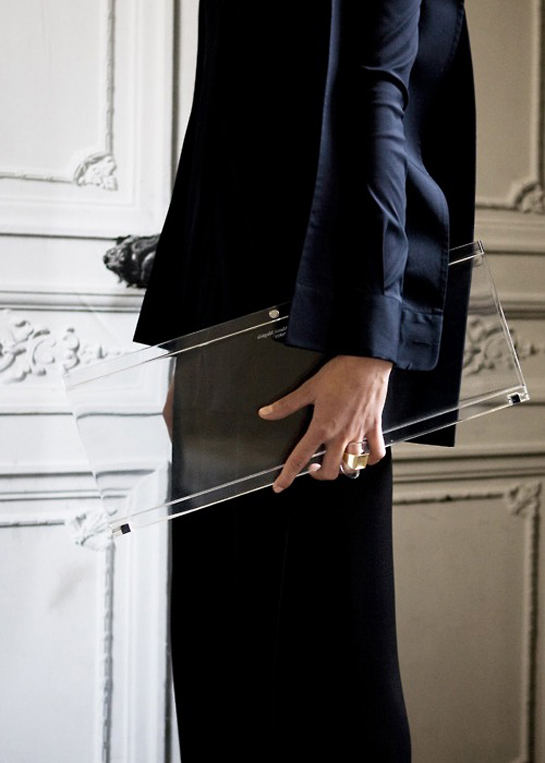 Just as this insanely beautiful transparent clutch by Maison Martin Margiela. Oh yes, i already noticed the new design, it’s beautiful. I like the new series, keep on coming! I love to muse, in particular expensive goodies and to focus on the affordable, ha! I read an article about MMM in the Dutch Vogue. So interesting, He lives in Italy now. I didn’t now he sells MMM to Renzo Rosso and he leaves his brand in 2009. The designers today are an unknown design group. The clutch is gorgeous!